The UTVA Aero 3 was a piston-engined military trainer aircraft built in Yugoslavia to replace the Ikarus Aero 2 then in service. 110 were built, in Yugoslav Air Force service from 1958 to mid-1970s. It was superseded by the UTVA 75. 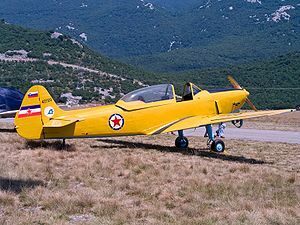 First flown in 1956 the Aero 3 was designed to meet a Yugoslav Air Force requirement for a primary trainer that could also be used in the army co-operation role. The Aero 3 was a low wing cantilever monoplane that seated the student and instructor in tandem under a bubble canopy. Of all wood construction it had a fixed, tailwheel landing gear and powered by a nose-mounted 190hp (142kW) Lycoming O-435-A piston engine.